SKINTOP® ST-M SKINTOP® ST-M glands can be relied on whenever cables and wires need to be safely inserted into housings. Proven to withstand the most demanding cleaning procedures thanks to IP 69 K approval. SKINTOP® MS-M Extra large: the SKINTOP® MS -M is also available in sizes M75 x 1.5 to M110 x 2. Incorporates an innovative double lamella gasket for easier assembly of cables with large diameters. SKINTOP® CLICK Simply click in – turn to the left – turn to the right – finished. The SKINTOP® CLICK couldn’t be easier. Consequently counter nuts are no longer needed. SKINTOP® BRUSH ADD-ON Worlds first patented active EMC lock-nut for a 360° screen contacting. 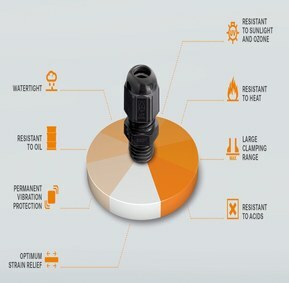 In combination with SKINTOP® ST-M polyamide cable glands – that is unique. NEW - SKINTOP® HYGIENIC The stainless steel cable gland SKINTOP® HYGIENIC is suitable for use in food production and the pharmaceutical industry. SKINTOP® COLD Ultra-cool: the SKINTOP® COLD withstands temperatures as low as –70 °C. In freezing plants, cold storage, the offshore sector and other applications where mechanical stability is critical. SKINTOP® K-M ATEX plus SKINTOP® always keeps its promise. 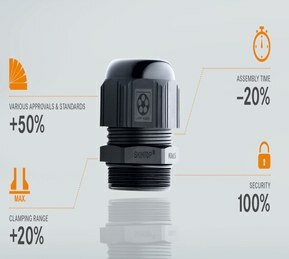 The SKINTOP ® K-M ATEX plus offers enhanced safety protection in hazardous areas – New with worldwide IECex approval. SKINTOP® SOLAR The SKINTOP® SOLAR, specially designed for photovoltaics, provides not only UV and ozone resistance but also high strain relief and permanent vibration protection. NEW - SKINTOP® CUBE MULTI With the new multi-cable entry system SKINTOP® CUBE MULTI, a particularly high packing density and optimum strain relief on the whole cable bundle are achieved. The elastic gel technology used for the sealing element enables large, variable clamping ranges. Individual hole configurations are available on request. SKINTOP® CUBE They don’t come more flexible than this. The SKINTOP® CUBE multi-cable bushing system with variable clamping ranges guarantees easy assembly and disassembly of pre-assembled cables. From now on with UL approval for international markets.